Offering sweeping views and rich architectural accents, W.K. 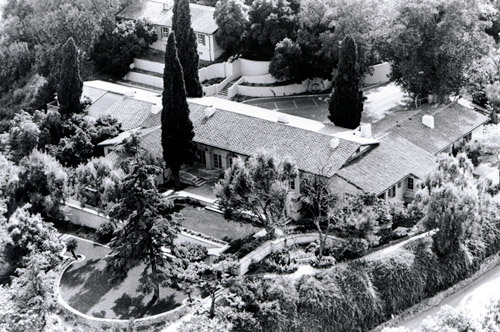 Kellogg’s West Coast retreat, Kellogg House, was built in 1926 and cost $150,000. The home, which sits atop a tree-shrouded hill on the northern edge of campus, was designed by renowned architect Myron Hunt, whose projects included the Pasadena Rose Bowl and the Huntington Library. Charles Gibbs Adams, a distinguished landscape architect who worked on the Hearst Castle gardens in San Simeon, California, designed the lush and colorful surroundings at Kellogg House. Although the home is 8,777 square feet, it evokes a more intimate feel because of its many rooms. Kellogg’s family and friends often visited the house. The extra rooms allowed Kellogg House to serve as lodging for the Army during World War II. The architectural décor is typical of a ranch-style house, but also features much finer details, such as the ceiling beams in the dining room where Kellogg’s initials are worked into the pattern. Additionally, the pipes from an organ were cleverly built into the basement, thus creating more space in the living area without sacrificing Kellogg’s beloved musical instrument. When the Kellogg family invited guests, the home was a magnet for celebrities of their day, including former President Ronald Reagan, Walt Disney, Will Rogers, Rudolph Valentino, Gary Cooper and Charles Lindbergh. Kellogg and his famous guests would enjoy walking around the grounds and visiting the Arabian horses. Kellogg House hasn’t changed much since 1926. Most of the furniture and décor that adorn the house are original pieces once owned by Kellogg and his family. This landmark house is open to the public for tours and is available for conferences, weddings and other special events. Kellogg House exudes vintage charm, offers mesmerizing views and accommodates groups of up to 200, making it the ideal location to celebrate any occasion.